ANDY MIYARES – Florida, USA. 9th June 1983. Andy has accomplished the unimaginable. He started swimming at 9 months old because he could not hold his head up. At the age of 6 he joined USA Swimming and has never left the pool since then! In 2002 he set his first American Record in the 50m butterfly. 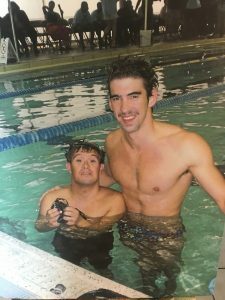 In 2006 Andy participated in the 3rd World DSISO Championships in Limerick, Ireland where he set a 1500m Freestyle world record for short course – which he held until 2016. He also held the world record for this event for long course. Andy still holds many American records and is now setting records in the Master 2 (M2 – 35+)) age group. He presently holds a number of world records in the M2 category. Andy received the an induction to the Hall of Fame of Special Olympics, Florida, for his contribution in advocating and speaking all over the world as a Special Olympics Global Messenger. His hero is Michael Phelps. He wants to have a girlfriend and get married. He will now continue to swim and break Master 2 records. He will also continue to coach younger swimmers in order for them to reach their dreams. For Maria Leandro Gutierrez de Ceballos we highlight the 18 gold, 18 silver and 20 bronze medals that have hung around the neck in all championships in Spain, Europe and the world in which she has participated since 2011. And also the 7 Master 2 world records, 7 of Europe records Master 2 and 10 achieved in Spain that were obtained in her participation in those same competitions. At age of 39 years old, she also participated in the Trisomy Games held in Florence, Italy and won medals. Maria Leandro Gutierrez de Ceballos in 2011 was awarded Andalusian Board as a high-performance athlete. 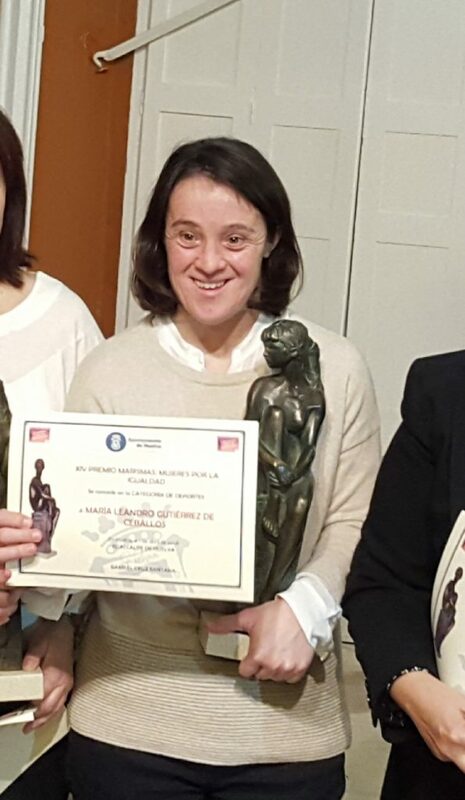 She has also received numerous awards by the provincial council and sports associations as the best athlete with disability in Huelva, Spain. The City Council of Huelva (Spain) have honored Maria by naming a municipal swimming pool after. What a wonderful acknowledgement from the community. Maria has achieved all this due to support from her family. Maria has always been dedicated to her sport, and trained tirelessly in order to achieve all these accolades. She never gives up and continues to push for perfection. She is very disciplined with her training. Her coach finds her an inspiration to work with. Maria received the Marismas Women`s Award for the Equality in the Sport Category because her life is a pure tribute to the greatness of being woman, of being a sportswoman and being equal. She has grown up being encouraged by her parents, Carmen & Paco. She has grown into an inspirational woman and excellent sportswoman. An encouragement to all who know her. At the 4th DSISO European Swimming Championships held in Bobigny, Paris in 2017, Maria decided to “hang up her racing costume”.